Introducing formal processes for performance and goal management into your unique small business culture may seem crazy. But in reality, they can create the perfect marriage. That's because the right combination of people and process can reinforce each other's strengths, improve productivity and increase engagement. 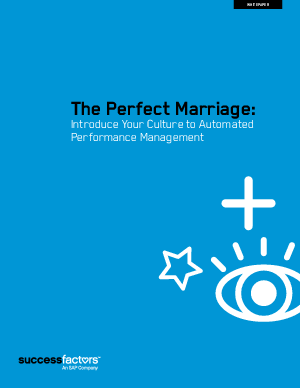 Download your copy now, compliments of SuccessFactors, and learn how to integrate your culture with automated performance management. By automating your paper-based performance management processes, you can increase insight into the workforce and, ultimately, transform your business- turning strategy into successful, measurable results. Learn more by downloading your report now, compliments of SuccessFactors.